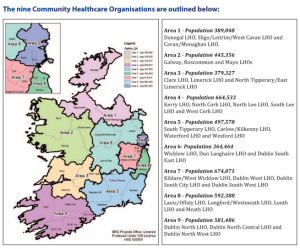 The Health Service Executive (HSE) is set to establish nine Community Healthcare Organisations (CHO) across the country, with the aim of making it easier for people to access local services, improving management and accountability, and allowing stronger local decision-making. CHOs are community healthcare services outside of acute hospitals, such as primary care, social care, mental health, and other health and well-being services. Social care services encompass those for older people and people with disabilities. Their establishment follows the publication of the report and recommendations of the Integrated Service Area review group in October 2014. As part of this, 90 Primary Care Networks, covering an average 50,000 population and placing an identified person as being responsible for service delivery to that population, are being set up across the country, with an average of ten networks assigned to each CHO. Family doctors will play a strengthened role in delivering primary care through the appointment of a GP Lead to each network, while a key worker will also work within each network to support people with complex needs. In each CHO, a Chief Officer will lead a local management team which focuses on all of the specialist services in their area. 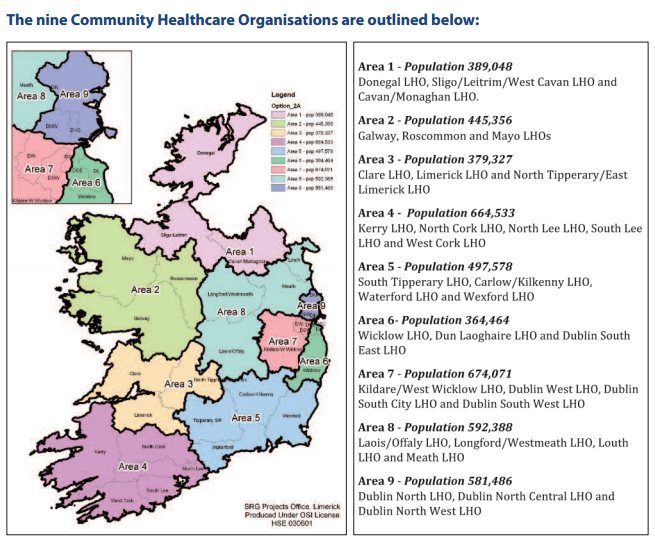 The CHOs are expected to be in place in early 2015, replacing the current grouping of non-hospital health services under 17 Integrated Service Areas. For more information about CHOs, please visit the report on this area on the HSE website by clicking here.